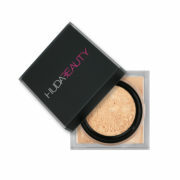 Suitable for light, medium and tan skin tones. Golden undertones brighten and disguise under-eye darkness. An easy-to-use loose powder, perfectly curated for all skin tones to create an airbrushed, long-lasting complexion while blurring the appearance of pores and fine lines, and holding makeup in place all day long. Eight shades, packed with ultra-refined pigments, to ensure the right fit for all skintones. The powders work to subtly color correct and highlight different contours of the face, leaving a translucent veil of color on your skin.